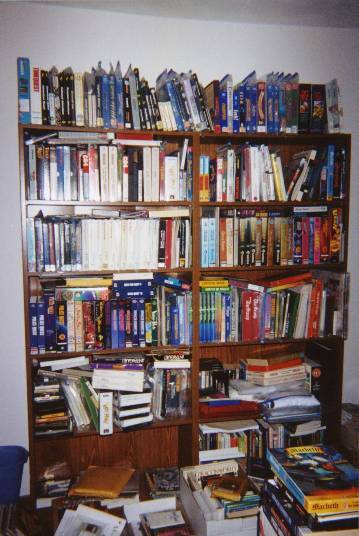 What follows is, as of the date above, the complete contents of my own personal software collection. Organization is alphabetical by company (developer), then by title, then by package variation, with different distributors noted in the individual item descriptions. Clicking on links, when available, will bring up scans and package information for my rare or more interesting items, or, in some cases, noteworthy package variations. If there's something I haven't scanned that you'd like to see a picture of, just ask! Each entry in the list below indicates one item: Except for package variations and, in some cases, shrinkwraps, I generally don't keep duplicates, preferring to place extra copies in the Shoppe (and to maintain some degree of unoccupied space in my apartment). You are free to borrow any scans from these pages, so long as they are used for reference only. That is, if you are setting up your personal want-list, or a page with information about adventure games, and want to include pictures of the packaging, great. (It'd be nice to get credit for the images, though, and perhaps a link to the Shoppe.) However, please do not use these scans to, for example, sell a rare title on eBay. My package may differ from the one you have -- it may have different amounts of wear in different places, shrinkwrap whereas yours has none (or vice-versa), and so forth. 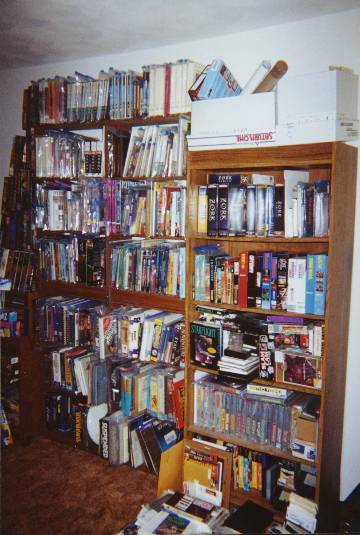 This list is provided solely to give other collectors an idea of what I have and don't have, and to allow you to look at some rare packages you otherwise might not have the chance to see (and, I admit, maybe to brag just a little). Absolutely nothing listed on this page is for sale or trade, under any circumstances. All requests pertaining to the sale or trading of these items will be utterly ignored. If you're looking for a particular item, try the waiting list. And just in case you missed it in the FAQ, no, I will not make copies of my disks for you. My reason for this is as follows: If I charge you for them, it's piracy (the copyright is still in print even though many of the games themselves are not). If I don't, then it's not worth the time and effort on my part. Please don't mail me asking for copies; I only deal in originals. One-piece box (Slash distribution), shrinkwrapped, IBM PC. Two-piece box, signed by Michael Berlyn, IBM PC. Cassette in medium clear plastic case with inlay, Commodore 64/128. One-piece box (Slash distribution), signed by Steve Cartwright, IBM PC. Two-piece box, shrinkwrapped, IBM PC. Plastic tray with black outer cardboard folder, BBC Micro. Hint booklet in sealed envelope, BBC Micro version. Hint booklet, BBC Micro version. Box with blue and black grid design, Acorn. Hint booklet, Acorn Electron version. Acornsoft Home Education packaging, BBC Micro. Cassette in medium clear plastic case with inlay, Amstrad. Activision Game Vault, Volume 3, shrinkwrapped, IBM PC. Activision's Commodore 64 15-Pack, shrinkwrapped, IBM PC. AI rainbow-striped box, Atari 8-Bit. AI S.A.G.A. plastic clamshell case, shrinkwrapped, Atari 8-Bit. AI S.A.G.A. styrofoam folder, shrinkwrapped (wrap torn on side), Apple II. AI styrofoam folder, later cover art, TRS-80. Small black plastic case with inlay (Adventure International U.K.), graphical version, Spectrum. Small black plastic case with inlay (Adventure International U.K.), non-graphical version, Spectrum. Texas Instruments windowed box with plain orange (cassette) cover inlay, TI-99/4A. Thunder Mountain plastic package, unopened, Commodore 64/128. AI styrofoam folder with glued-on cover, white AI logo on spine, shrinkwrapped, Atari 8-Bit. AI styrofoam folder, later cover art. AI plastic bag, unopened, cassette version, Atari 8-Bit. AI styrofoam folder with glued-on cover, early cover art, Atari 8-Bit. AI styrofoam folder, later cover art, shrinkwrapped, TRS-80. Commodore VIC-20 U.S. packaging, shrinkwrapped. S.A.G.A. plastic clamshell case, Atari 8-Bit. AI rainbow-striped box, Apple II. AI styrofoam folder, shrinkwrapped, Atari 8-Bit. AI styrofoam folder, shrinkwrapped, TRS-80. Prism Leisure release, cassette in medium clear plastic case with red-and-white striped inlay, system unknown. Large box compilation by Remlig/Starsoft, contains Sorcerer of Claymorgue Castle, Hulk, Spider-Man, Human Torch and Thing, Buckaroo Banzai, and some non-adventure titles, IBM PC. AI styrofoam folder, early cover art, TRS-80. Small black plastic case with inlay (Adventure International U.K.), Commodore 64/128. AI rainbow-striped box, shrinkwrapped, Atari 8-Bit. Americana release, cassette with case and inlay, Commodore 64/128. Clear plastic disk case with inlay, IBM PC. Load 'n' Go larger plastic package, unopened, Atari 8-Bit. Load 'n' Go larger plastic package, unopened, Commodore 64/128. Load 'n' Go larger plastic package, upside-down, unopened, IBM PC. Load 'n' Go smaller plastic package, unopened, Apple II. All American Adventures hard plastic folder, Commodore 64/128. All American Adventures loose disk and black-and-white instruction sheet, Atari ST. Plastic package with black-and-white manual, unopened, system unknown. Interactive Fiction: His Majesty's Ship "Impetuous"
AI styrofoam folder with glued-on cover (also includes Two Heads of the Coin, Local Call for Death, Encounter in the Park, Dragons of Hong Kong), TRS-80. AI styrofoam folder, Apple II. AI S.A.G.A. plastic clamshell case, shrinkwrapped, "Secret Mission" sticker over the original title on front and spine, Atari 8-Bit. AI S.A.G.A. plastic clamshell case, unopened, Atari 8-Bit. AI styrofoam folder, later cover art, shrinkwrapped, Atari 8-Bit. Commodore European box ("Atomic Mission"), Commodore 16/64. Commodore U.S. box ("Atomic Mission"), Commodore 16/+4. Commodore VIC-20 U.S. packaging ("Mission Impossible Adventure"). Small black plastic case with inlay (Secret Mission) (Adventure International U.K.), Commodore 64/128. Texas Instruments windowed box with artwork cover inlay, TI-99/4A. Black-and-white artwork cover, 38 pages, covers #1 - #14, Hulk. Black-and-white artwork cover, 46 pages, covers #1 - #14, Hulk, Buckaroo Banzai, Spider-Man. Black-and-white striped cover, 36 pages, covers #1 - 14. Rainbow-striped cover, 36 pages, covers #1 - 14. AI styrofoam folder, later cover art, Atari 8-Bit. Commodore European box, Commodore 16/64. Commodore U.S. box, Commodore 16/64. Commodore VIC-20 U.S. packaging ("Pirate Cove"), shrinkwrapped. Small black plastic case with inlay (Adventure International U.K.), Spectrum. Texas Instruments red plastic package (packaged with Adventure Command Module), unopened, TI-99/4A. Texas Instruments windowed box, inlay with art (packaged with Adventure Command Module), TI-99/4A. Texas Instruments windowed box, plain inlay (packaged with Adventure Command Module), unopened, TI-99/4A. AI styrofoam folder, early cover art, Atari 8-Bit. Cassette in medium clear plastic case with inlay, BBC Micro. Texas Instruments red plastic package, unopened, TI-99/4A. Small black plastic case (Adventure International U.K.), writing on tape label, Spectrum. Tynesoft release, MK-II plastic case with inlay, Commodore 64/128. AI large styrofoam folder, CP/M. AI plastic bag, unopened, disk version, Commodore 64/128. Loose disk and manual, also includes Knight Ironheart Adventure, TI-99/4A. StarSoft yellow box, IBM PC / Commodore / Apple / Atari. TDC Distributors plastic bag, unopened, Atari 8-Bit. Tex-Comp "Spidey Special" release (also includes Sorcerer of Claymorgue Castle, Return to Pirate's Isle, Buckaroo Banzai, Hulk, Spider-Man, June Lake) in plain yellow envelope, cassette version, sealed, TI-99/4A. Tex-Comp release (also includes Sorcerer of Claymorgue Castle) in plain yellow envelope, cassette version, sealed, TI-99/4A. Cassette with Xeroxed instructions in large Ziploc bag, Atari 8-Bit. Master Games / U.S. Gold repackaging, cassette in medium clear plastic case with inlay, Commodore 16/+4. Master Games / U.S. Gold repackaging, cassette in medium clear plastic case with inlay, Commodore 64/128. Keypunch Software repackaging (1987), Apple II. Keypunch Software repackaging (1993), IBM PC. Rainbow-striped box (Adventure International U.K.), signed by Scott Adams, Atari 8-Bit. Disk and red manual in plastic bag, Apple II. Load 'n' Go smaller cut-open plastic package, unopened, Commodore 64/128. Load 'n' Go smaller pull-open plastic package, system unknown. Rainbow-striped box (Adventure International U.K.), Commodore 16/+4. Texas Instruments windowed box with plain brown (disk) cover inlay, TI-99/4A. AI styrofoam folder, early cover art, blue lettering on back, Atari 8-Bit / TRS-80, Atari 8-Bit. AI styrofoam folder, early cover art, black lettering on back, Apple II / TRS-80. AI styrofoam folder, early cover art, blue lettering on back, Apple II / TRS-80. AI styrofoam folder, early cover art, black lettering on back, shrinkwrapped, Atari 8-Bit / TRS-80. AI styrofoam folder, later cover art, blue lettering on back, shrinkwrapped, Atari 8-Bit / TRS-80. Marvel comic book (Marvel Fanfare #33). Cassette in medium clear plastic case with inlay (U.S. Gold), BBC Micro. Cassette with case and inlay, Commodore 64/128. Small black plastic case, Commodore 64/128. Cassette with case and inlay, Spectrum. Cassette with case and inlay, Amstrad. Disk and manual in plastic bag, unopened, TI-99/4A. Disk and manual in plastic bag, unopened. Thunder Mountain plastic package, unopened, Macintosh. Folder, signed by Raymond Benson, IBM PC. Folder, shrinkwrapped, Apple / IBM PC. Thunder Mountain Action Pack #1, IBM PC. Thunder Mountain plastic package, unopened, Apple II. Folder, red title, shrinkwrapped, IBM PC. Folder, white title, shrinkwrapped, Macintosh. Folder, signed by Raymond Benson, plastic sleeve unopened, Apple II. Thunder Mountain plastic package, unopened, IBM PC. Disk in Apple Software Bank double-sleeve, Apple II. Disk in Diskware double-sleeve, Apple II. White/orange manual in plastic sleeve, Apple II. Folder package, flattened, shrinkwrapped, IBM PC. Large white plastic clamshell folder with black inlay, German language, Commodore 64/128. Square black plastic case, Atari 8-Bit. Cassette with case / inlay (blue-border Artic) / tip sheet, Spectrum. Cassette with case and Sinclair inlay, Spectrum. Cassette with case and blue-border Artic inlay, Spectrum. Cassette with case and magenta-border Artic inlay, ZX81. Cassette in case with inlay ("Alien Spaceship Adventure"), ZX81. Cassette with case and early blue paper inlay (Alien Spaceship Adventure), Spectrum. Disk and manual, order form cut off, Commodore 64/128. Disk and manual in plastic sleeve, unopened, TI-99/4A. Disk and instruction folder, TI-99/4A. Disk and instruction folder in cut-open plastic sleeve, TI-99/4A. German, large plastic clamshell case, Atari 8-Bit. Disk and 8.5" x 11" manual, shrinkwrapped, Atari 8-Bit. Cassette in small plastic case with inlay, Amstrad. Cassette in thin medium clear case with inlay, Atari ST.
Attic box, one corner torn, Amiga. AriolaSoft square plastic case (Dragonware logo in manual), Amiga. Ariolasoft plastic case, German version, Atari ST.
Dragonware box, English version (Creepy Nites), Amiga. Cassette with case and inlay. Blue box with window cover art, shrinkwrapped, Apple II. Tan box with wizard / princess cover art, Apple / TRS-80 / Atari. Cassette package, Apple / TRS-80 / Atari. Cassette package TRS-80 / Apple / Commodore PET. Disk package, shrinkwrapped, Commodore 64/128. Disk and instruction folder, Apple II. CD and jewel case, IBM PC. Bantam "Living Literature" package, Apple II. Small Firebird box, shrinkwrapped, IBM PC. Bantam "Living Literature" package, inner materials still wrapped, Apple II. Small Firebird box ("Sherlock Holmes"), Commodore 64/128. Small Firebird box ("Sherlock Holmes"), shrinkwrapped, Apple II. Small Firebird box ("Sherlock Holmes"), shrinkwrapped, IBM PC. Gameware repackaging (with a non-IF game, Task Force), shrinkwrapped, Commodore 64/128. Cassette with case and inlay, Oric-1. Cassette with case and inlay (warrior artwork), Commodore 16/+4. Cassette with case and inlay (wizard / dragon / spiral staircase artwork), Spectrum. U.S. repackaging by Gameware / Tri-Micro (with a non-IF game, Corom), Commodore 64/128. Medium black plastic case with inlay, Spectrum. Game package, unopened, runs on most systems. Plastic case, sealed, system unknown. Disk and folder in plastic bag, signed by Donald Brown, Apple II. Disk and paperboard folder, sealed, wrap torn, Apple II. Cassette in medium clear plastic case with inlay, Spectrum. Loose Adventure International styrofoam folder cover, Apple II system sticker. Adventure International plastic clamshell case, Atari 8-Bit. Adventure International styrofoam folder, Apple II. Cardboard box, shrinkwrapped, Commodore 64/128. Cardboard box, dot-matrix title, shrinkwrapped, Commodore 64/128. Cassette with case / inlay / instructions, Commodore 64/128. Cassette with case / inlay / instructions, Commodore 16/+4. Cassette in MK-II plastic case with inlay, Commodore 64/128. Large black plastic case with inlay, Spectrum. Cassette in medium black plastic case with inlay, Amstrad. Disk in medium clear plastic case with inlay, Spectrum. Hard plastic folder, Commodore 64/128. Large black plastic case, Amstrad. Thunder Mountain box, IBM PC. Loose disk and instructions, Commodore 64/128. Cassette in MK-II plastic case with inlay, Amstrad. Flat clear plastic case, Commodore 64/128. Disk pouch, unopened, IBM PC. Two-piece box, shrinkwrapped, Apple II. Cassette in MK-II plastic case with inlay (both CRL and Delta 4), Commodore 64/128. Small black plastic case, Spectrum. Alternative Software release, cassette with case and inlay, Spectrum. First Class Cruise Kit, sealed, IBM PC / Mac CD-ROM (Dual). Black cardboard box, Commodore 64/128. Hard plastic folder with inlay, Atari 8-Bit. Large black plastic wallet package, Commodore 64/128. Interactive Fantasies disk, loose, Apple II. Peachtree package, shrinkwrapped, Apple II. Interactive Fantasies box, Apple II. Edu-Ware 8.5" x 11" yellow-orange instruction sheet, no disk. Interactive Fantasies green box, Atari 8-Bit. Folding box, German version, Atari ST. Global Explorer expansion disk, Apple II. Early release (6 separate pages for fingerprint files), Commodore 64/128. Later release (fingerprint files on 2 pages), Commodore 64/128. Hard plastic folder, shrinkwrapped, TRS-80. Small square cardboard box, Spectrum. Book-flap box, shrinkwrapped, IBM PC. Load 'n' Go larger plastic package, unopened, Apple II. Cassette with case / inlay instructions / hint sheet, Spectrum. Large black plastic case, Spectrum. Cassette with case / inlay / instructions, Spectrum. Loose manual, fits large black plastic case, Amstrad. Medium black plastic case, Acorn Electron. Goodtimes Software blue compilation box with Commander Keen: Aliens Ate My Babysitter and Cyberwars, IBM PC. Paperboard disk pouch, unopened, IBM PC. Shareware Testing Laboratories plastic package, cut open, IBM PC. Small plastic package, IBM PC. Small square box, blue/green, shrinkwrapped, IBM PC. Small square box, red/brown, IBM PC. One-Step Software larger plastic package, unopened, Commodore 64/128. Box with hang-hole, Commodore 64/128. Box without hang-hole, Apple II. Folder, signed by Dan Kitchen, Apple II. Small black plastic case, Amstrad. Small black plastic case (different inlay art), Spectrum. Instruction manual / hint book. Printed materials: Manual / hint book (signed by Michael Roberts), map, reference card,. 1.0 Manual, signed by Michael Roberts. 1.2 Release Notes, signed by Michael Roberts. 2.2 Upgrade Manual, signed by Michael Roberts. Softsmith release, loose disk and manual, Apple II. Box Office U.S. release, IBM PC. Red plastic case with inlay, English version, Amiga. Red plastic case with inlay, German version, Atari ST.
Bantam Software package, Commodore 64/128. Small Firebird box, shrinkwrapped, Commodore 64/128. IBM plastic case, inlay signed by author Scott Edwards. Folder, no Alert logo (later release), IBM PC. Folder, with Alert logo (first release), Macintosh. Large slipcover re-release package, IBM PC. Small white box re-release, Macintosh. Box with white plastic face, shrinkwrapped, IBM PC. Folder package, shrinkwrapped, Atari ST.
Large slipcover re-release package, shrinkwrapped, IBM PC. Shrinkwrapped, Nintendo GameBoy Color ("Shadowgate Classic"), Nintendo GameBoy Color. Small white box re-release package, IBM PC. Box package, shrinkwrwapped, Commodore 64/128. Large slipcover re-release package, Macintosh. Large two-piece re-release package, IBM PC. Small black plastic case with inlay, Oric-1. Cassette in small plastic case with inlay, Spectrum. Large black wallet package, ISL inlay, Commodore 64/128. Large black wallet package, ISL inlay, Spectrum. Large black wallet package, PG inlay, Spectrum. Small black plastic case with inlay, Commodore 64/128. Double Gold series, medium clear plastic case with inlay, Amstrad. Shrinkwrapped, thicker box, IBM PC / Mac CD-ROM (Dual). Shrinkwrapped, thinner box, IBM PC / Mac CD-ROM (Dual). Opened, signed by Bob Bates, IBM PC. Asgard Software release (white manual in plastic sleeve), TI-99/4A. SoftSel European distribution (grey box with sticker), Atari 8-Bit. InvisiClues and map, sealed blister pack. Includes Ral Partha miniature order form and limited edition pin, Amiga. Prism Leisure "PC Hits" budget re-release, Amiga. Soft-World Taiwanese release, IBM PC. Ral Partha Phoenix Hawk LAM figure, FASA and Jeux Descartes addresses on rear. Ral Partha Phoenix Hawk LAM figure, FASA and Ral Partha addresses on rear. German version, slipcased box, IBM PC. Signed by designer Tony Van, IBM PC. Opened, signed by Brian Moriarty, IBM PC. InvisiClues (with Plundered Hearts) and map, loose. Opened, signed by Marc Blank, IBM PC. Loose disk with odd label, IBM PC. Printer's proof of Better Beezer credit card application. Opened, manual signed by George Alec Effinger, IBM PC. Blue "Essentials" European box, IBM PC / Mac CD-ROM (Dual). MacPack Sneak Attack shovelware compilation, shrinkwrapped, Macintosh. White (U.S.) box, IBM PC / Mac CD-ROM (Dual). Shrinkwrapped, IBM PC / Mac CD-ROM (Dual). Blue plastic case with slipcover, shrinkwrapped, IBM PC. Blue plastic case, with small manuals, IBM PC. Budget release with no outer package, shrinkwrapped, IBM PC. Demo packet, in sealed paperboard envelope, IBM PC. Large manual version, no outer case (has manual, disks, quick reference card, keypad overlay), IBM PC. Sealed cardboard carton, IBM PC. Dealer offer ($100 rebate on 3-pack). Preview announcement flyer ("From the company whose first software product outsold Lotus 1-2-3"). Sale sheet, one-sided, B&W two- and three-column ads. Opened, signed by Michael Berlyn, Apple II. Loose note from "message in a bottle" dealer promo. Commodore small folder package, horizontal catalog number, shrinkwrapped. Folio package, first release (partial folder, mentions Zork I and II), shrinkwrapped, NEC APC. Folio package, second release (mentions Zork trilogy, Starcross), shrinkwrapped, Apple II. Folio package, third release (mentions Zork, Witness, Starcross, Suspended, Planetfall, Enchanter, Infidel), shrinkwrapped, IBM PC. Grey box, opened, signed by Marc Blank, IBM PC. Grey box, shrinkwrapped, IBM PC. Mastertronic package (#10), shrinkwrapped, Atari ST.
InvisiClues and unfolded map, Zork Users Group. InvisiClues map supplement, Zork Users Group. Folio package, shrinkwrapped, DEC RT-11. Folio package, signed by Marc Blank, Apple II. Grey box, opened, Atari 8-Bit. Grey box, shrinkwrapped, Atari ST.
Mastertronic package (#8), small tape rip on one edge, IBM PC. Signed by Michael Berlyn, IBM PC. First release, Wheeler Street address, sealed blister pack, IBM PC. Later release, red "Free with Coupon!" and CambridgePark address, sealed blister pack, Atari 8-Bit. Grey box, opened, Commodore 64/128. Grey box, shrinkwrapped, Apple II. Loose disk, evaluation copy with dot-matrix label, Apple II. Solid Gold package, Apple II. Press kit, in large grey folder with logo sticker. Opened, signed by "Hollywood" Dave Anderson, IBM PC. Shrinkwrapped, with promotional sticker, IBM PC. InvisiClues (with Bureaucracy), sealed blister pack. Sale sheet, one-sided, B&W ad image and copy. Folio package, signed by Michael Berlyn, Commodore 64/128. Grey box, opened, signed by Michael Berlyn, Atari ST.
Mastertronic two-piece box, IBM PC. Grey box, opened, Apple II. Mastertronic (Tronix) package (#5), Amiga. Solid Gold package, shrinkwrapped, Apple II. InvisiClues (with Stationfall) and map, loose. Printer's proof of G.U.E. Tech booklet. Small plastic case with Infocom logo, IBM PC. Dealer promo ("USNA Today" newspaper). Grey box, shrinkwrapped, Atari 8-Bit. Software Selection Service "Software of the Month" Edition, Apple II. Bumper Sticker - "I (heart) Zork". Button - "I'd Rather be Zorking" (Zork Users Group). Button - "Master Adventurer" (Zork Users Group). Button - "Zorkers Do It Under the Rug" (Zork Users Group). Calculator / business card case with engraved Infocom logo. Envelope - Computer screen, broken and smoking. Envelope - Hand with envelope in mailbox (Brian White artwork). Envelope - Troll with axe (Samuel Shepherd artwork). Newsletters (The New Zork Times, The Status Line), complete set. Photo of Douglas Adams and Steve Meretzky, signed by both. Poster - "A human never stands so tall as when stooping to help a small computer". Poster - Moonmist, signed by Stu Galley. Poster - Zork I (Zork Users Group). Poster - Zork II (Zork Users Group). Poster - Activision game library, 1993-1994. Second City invitation and program (event for Stationfall and Lurking Horror). Sweatshirt - "Bring Your Own Brain". T-Shirt - "New Zork Times Puzzle Winner". T-Shirt - Leather Goddesses of Phobos ("A Dirty Mind is a Terrible Thing to Waste"). Printer's proof of Kevin Pope cartoon booklet. Folio package, early version, shrinkwrapped, Apple II. Folio package, later version, Atari 8-Bit. Solid Gold package, IBM PC. InvisiClues, sealed blister pack, solid black backboard. Opened, signed by Amy Briggs, Commodore 64/128. InvisiClues (with Beyond Zork) and map, loose. Large two-piece box, IBM PC. Small one-piece box, shrinkwrapped, IBM PC. Opened, signed by Amy Briggs, Macintosh. Blue "Essentials" European box, IBM PC. Large one-piece box, shrinkwrapped, Macintosh. One-piece Activision Classics box, shrinkwrapped, IBM PC. Stand-alone CD and jewel case (sold without box), IBM PC. Encyclopedia Frobozzica, signed by Nino Ruffini. Sale sheet, Japanese PC-FX release. Sale sheet, Japanese PlayStation release. Unopened, Apple II / IBM PC. IBM PC / Mac CD-ROM (Dual). InvisiClues, black blister card with yellow plastic, unopened. Original photo for back of package, with photographer's notations. "Soul of the Samurai" original mockup. Printer's proof of "Soul of the Samurai". Folio (saucer) package, Atari 8-Bit. Grey box, opened, IBM PC. Opened, no disk or system label. InvisiClues (with Lurking Horror) and map, loose. Press release with letter from Floyd. Commodore inlay from plastic case, with disk and manual (no outer plastic bag), Commodore 64/128. Commodore small folder package, slightly misaligned, text above face picture, shrinkwrapped. Commodore small folder package, text above face picture, shrinkwrapped. Commodore small folder package, text below face picture, shrinkwrapped. Commodore small generic "Software" folder package, with window for game title, shrinkwrapped. Folio (face mask) package, Apple II. Folio (face mask) package, shrinkwrapped, Apple II. Grey box, signed by Michael Berlyn, IBM PC. Opened, signed by Brian Moriarty, Apple II. InvisiClues, opened but unused, with blister pack. Grey box, does not mention stone, IBM PC. Grey box, mentions stone, opened, signed by Brian Moriarty, Commodore 64/128. Grey box, mentions stone, shrinkwrapped, Apple II. Launch party invitation and museum map. Set of cards from nut can dealer promo kit. Folio package, first release (mentions Zork trilogy, Deadline, Starcross, Suspended), shrinkwrapped, TRS-80. Folio package, second release (mentions Deadline, Zork trilogy, Enchanter, Starcross, Suspended, Planetfall, Infidel), shrinkwrapped, NEC APC. InvisiClues, sealed blister pack, solid black backboard with grey pen. One-piece box, unopened, IBM PC. CD-ROM version, shrinkwrapped, IBM PC. German Green Pepper re-release, IBM PC. German version (Zork: Der Großinquisitor), CD-ROM, IBM PC. Japanese version, CD-ROM, IBM PC. MacPlay release in DVD case, Macintosh. XPlosiv budget release in DVD case, IBM PC. Blister pack (folio), large, Wheeler Street address, signed by Marc Blank, unopened, Apple II. Blister pack (folio), small, Faneuil Hall address, signed by Marc Blank, unopened, Apple II. Blister pack (folio), small, Wheeler Street address, unopened, Atari 8-Bit. Commodore inlay from plastic case, with disk and manual in plastic bag. Commodore small folder package, horizontal catalog number and UPC, shrinkwrapped. Grey box, opened, signed by Marc Blank, Atari 8-Bit. Japanese graphic adventure, Sega Saturn. Personal Software package ("Zork"), large manual version in plastic bag, TRS-80 Model I. Personal Software package ("Zork"), loose small manual, Apple II. Solid Gold package, shrinkwrapped, Macintosh. Witt's Notes hint book, 1984 version. InvisiClues and map, in opened blister pack. InvisiClues and map, Zork Users Group. Sale sheet, Japanese graphic adventure for Playstation. Sale sheet, Japanese graphic adventure for Sega Saturn. Blister pack (folio), large, Wheeler Street address, unopened, Apple II. Blister pack (folio), small, Faneuil Hall address, opened, Apple II. Commodore large folder package, shrinkwrapped. Commodore small folder package, vertical catalog number and UPC, shrinkwrapped. Digital repackaging, shrinkwrapped, DecMate II. Loose diskette, orange lettering, Apple II. InvisiClues and map (unfolded), Zork Users Group. Blister pack (folio), large, Wheeler Street address, Atari 8-Bit. Blister pack manual in plastic bag, Wheeler Street address, unopened, IBM PC. Digital repackaging, shrinkwrapped, DEC Rainbow. Grey box, opened, signed by Marc Blank, Apple II. German version ("Zork Special Edition"), IBM PC. U.K. version ("Zork Adventure Trilogy"), IBM PC. U.S. version, shrinkwrapped, IBM PC. A-List re-release box, IBM PC. French version ("Les Territoires Interdits"), shrinkwrapped, Macintosh. French version ("Les Territoires Interdits"), Ubisoft "Collection Classique" re-release, shrinkwrapped, IBM PC. German Green Pepper re-release ("Zork Nemesis: Das Verbotene Land"), IBM PC. German version ("Zork Nemesis: Das Verboten Land"), IBM PC. Limited edition interactive preview, IBM PC. XPlosiv budget release in DVD case, shrinkwrapped, IBM PC. Large promotional store display box. Big Red Computer Club release, Apple II. Opened, signed by Elizabeth Langosy, Commodore 64/128. Opened, signed by Elizabeth Langosy, IBM PC. Cassette in medium clear plastic case w/ inlay, Amstrad. Cassette w/ case and inlay, Commodore 64/128. Cassette w/ case and inlay, Amstrad. Included in 10 Computer Hits package, black plastic case, Amstrad. Box package, shrinkwrapped, Apple II. Box package, shrinkwrapped, Commodore 64/128. Cassette in case with inlay, Spectrum. Large black plastic case with inlay, Commodore 64/128. Signed by Michael and Muffy Berlyn, Apple IIGS. A+ Disk Magazine release, Apple II. Apple / Commodore / IBM PC. Larger red box, shrinkwrapped, IBM PC. Smaller gold box, IBM PC. Two-piece box with review blurbs and CGW award, CD-ROM version, IBM PC. Two-piece box with review blurbs, CD-ROM version, IBM PC. Two-piece box, disk version, signed by Bob Bates, IBM PC. One-piece CD-ROM re-release box, shrinkwrapped. Two-piece box, disk-based, IBM PC. Hint book (included in two-piece packaging). Two-piece box box, IBM PC. T-Shirt - "Sorcerer University" (Spellcasting series). Fantasy Adventure Pack (Slash complation with Leisure Suit Larry 1 VGA remake and Elvira), IBM PC. Hint book, tapered spine, no ISBN/barcode on back. Hint book, title on spine, ISBN/barcode on back. Signed by Bob Bates, IBM PC. Wallet cassette package, wizard on inlay spine, Commodore 64/128. Wallet disk package, wizard on inlay spine, Commodore 64/128. Handwritten clue sheets by Pete Austin. Cardboard box package, shrinkwrapped, Oric-1. Wallet cassette package, dragon on inlay spine, Commodore 64/128. Plastic case in Constellation blister pack, unopened, Amiga. Larger Virgin plastic case, MSX. Larger Virgin plastic case, in hanging plastic package, sealed, Spectrum. Ricochet budget re-release, cassette in small plastic case with inlay, Amstrad / Spectrum. Black Firebird plastic case, shrinkwrapped, Commodore 64/128. Blue Rainbird box, shrinkwrapped, Atari ST.
DataSoft US package, shrinkwrapped, Amiga. Mandarin UK package, shrinkwrapped, Atari 8-Bit. Wallet cassette package, wizard on inlay spine, early cover art, Spectrum. Wallet cassette package, wizard on inlay spine, later cover art, MSX. MK-II plastic case, inlay has award symbols, Spectrum. MK-II plastic case, inlay w/o award symbols, Spectrum. Wallet cassette package, wizard on inlay spine, early cover art, BBC Micro. Wallet cassette package, wizard on inlay spine, later cover art, Atari 8-Bit. Wallet disk package, wizard on inlay spine, later cover art, Commodore 64/128. Large black plastic case, Commodore 64/128. Large black plastic case, shrinkwrapped, Amstrad. MK-II plastic case, Commodore 64/128. MK-II plastic case, no barcode on inlay, Commodore 64/128. Blue Rainbird box, Commodore 64/128. Wallet cassette package, wizard on inlay spine, BBC Micro. Wallet cassette package, wizard on inlay spine, Crash award on inlay, Atari 8-Bit. DataSoft US package, shrinkwrapped, IBM PC. Mandarin UK package ("Time and Majik Trilogy"), Spectrum. MK-II plastic case, inlay has award symbols, Amstrad. MK-II plastic case, inlay w/o award symbols, Commodore 64/128. Demo disk and instructions, Commodore 64/128. US packaging, shrinkwrapped, Apple II. European box, instructions in English and German, Amiga. European package, shrinkwrapped, IBM PC. U.S. package, shrinkwrapped, IBM PC. Large banner package, IBM PC. Small banner package, shrinkwrapped, Atari ST.
Small black plastic case with slipcover, Sinclair QL. One-piece U.S. slipcover box, IBM PC. Two-piece U.S. box, shrinkwrapped, IBM PC. Cassette with case only, TRS-80. Cassette with case and inlay, Mastertronic logo, Commodore 64/128. Cassette with case and inlay, Mastervision logo, Commodore 64/128. Box, IBM PC / Commodore. One-piece box, IBM PC / Commodore. Clamshell (plastic on cardboard) case, Apple II. Two-piece box (by "Lawrence Productions"), Apple II. All American Adventures European release, cassette in medium clear plastic case with inlay, Commodore 64/128. Screenplay plain white box (actually Asylum II), shrinkwrapped, Commodore / Atari. Loose cassette and manual, TRS-80. Screenplay notched box with glued-on back cover (two-column version), Apple II. Screenplay notched box with glued-on back cover, shrinkwrapped, Atari 8-Bit. Screenplay non-notched box with printed back cover, Commodore 64/128. Screenplay notched box with glued-on back cover (screenshot version), Apple II. European release in hard plastic folder (All American Adventures / American Eagle), Atari 8-Bit. Loose disks with dot-matrix printed labels, system unknown. Cassette in medium clear plastic case with inlay (All American Adventures), Commodore 64/128. European release in hard plastic folder (All American Adventures / Screenplay), Atari 8-Bit. Screenplay notched box with printed back cover, Atari 8-Bit / Commodore 64. Large plastic tray with paperboard top cover, Commodore 64/128. Cassette w/ case and inlay, warranty card torn off, Commodore 64/128. Addison-Wesley later (orange) package, shrinkwrapped, Commodore 64/128. Addison-Wesley later (orange) package, shrinkwrapped, IBM PC. Medium clear plastic case, in hanging plastic package, sealed, Spectrum. Addison-Wesley early (tan) package, Apple II. Addison-Wesley early (tan) package, Commodore 64/128. Addison-Wesley early (tan) package, gold-letter complimentary copy, IBM PC. Addison-Wesley later (green) package, IBM PC. A Guide to Playing "The Hobbit"
Computer and Video Games review blurb on cover. No review blurb on cover. Large plastic tray with paperboard top cover, Spectrum. Large plastic tray, missing paperboard top cover, Commodore 64/128. Addison-Wesley early (tan) package, IBM PC. Addison-Wesley early (tan) package, no system or product number on spine, Apple II. Addison-Wesley later (red) package, IBM PC. Addison-Wesley later (red) package, shrinkwrapped, Apple II. Black cardboard box, Sinclair logo on manual, Spectrum. Flat plastic folder, IBM PC. Player's guide (2 slightly different covers). Flat plastic folder, Commodore 64/128. Large plastic case, Commodore 64/128. Cassette in medium clear plastic case with inlay, German version, Amstrad. Addison-Wesley later (blue) package, shrinkwrapped, IBM PC. Medium clear plastic case with inlay, in unopened Ricochet blister pack, Commodore 64/128. Blue/red cardboard box with paperboard top cover, shrinkwrapped, Commodore 64/128. Yellow/blue cardboard box with paperboard top cover, early manual, Spectrum. Yellow/blue cardboard box, missing paperboard top cover, later manual, Spectrum. Michtron slipcover box, Atari ST.
Two-piece box with Byte review blurb, IBM PC. Two-piece red box with Byte review blurb, Amiga. Cassette with case and inlay, Dragon 32. Cassette with case and inlay, TRS-80. Cassette with case and inlay, TRS-80 / Dragon. Loose disk and manual, Apple II. Disk and manual in plastic bag, TRS-80. Channel 8 small plastic wallet, Commodore 64/128. Paxman Promotion, cassette with case and inlay, Commodore 64/128. Channel 8 small plastic wallet, has AI U.K. address label, Commodore 64/128. Comm*Data / Channel 8 large yellow plastic case, shrinkwrapped, Commodore 64/128. Paxman Promotion, cassette with case and inlay, Commodore 16/+4. Channel 8 small plastic wallet, Atari 8-Bit. Dixon's Pack, cassette (black lettering) with case and inlay, Spectrum. Cassettes in medium clear plastic case with inlay, Amstrad. Large black binder, Apple II. Loose disks and manual from box package, Atari 8-Bit. Impressions European release, IBM PC. Avalon Hill box, shrinkwrapped, Commodore 64/128. Creative Sparks black plastic case, Commodore 64/128. Memorex repackaging (Dark Passages II), with Wizardry VII and The CHAOS Continuum, shrinkwrapped, IBM PC. Polarware package, Geneva address, Apple II. Polarware package ("From Polarware / Penguin"), blue Comprehend logo, Geneva address, Commodore 64/128. Polarware package ("From Polarware Inc"), blue Comprehend logo, Geneva address, Commodore 64/128. Polarware package (also has Penguin logo), black Comprehend logo, Geneva address, Commodore 64/128. Polarware package (Polarware logo only), blue Comprehend logo, Batavia address, IBM PC. Keslinger Rd address, Apple II. Polarware package, Geneva address, shrinkwrapped, Amiga. Polarware package, Geneva address, signed by Michael and Muffy Berlyn, IBM PC. Penguin package, border around company/system info on back, Macintosh. Penguin package, no border around company/products info on back, Apple II. Penguin package, shrinkwrapped, Apple II. Polarware package, "Comprehend with graphics" box, Geneva address, shrinkwrapped, Amiga. Polarware package, "Comprehend" box, Geneva address, IBM PC. Pouch package, shrinkwrapped, Apple II. Disk and manual in plastic bag, Apple II. Starcraft Japanese release in large folder, Apple II. Large folder, shrinkwrapped, Atari ST. Cassette with case and inlay, system unknown, Spectrum. Cassette with large manual, green hallway cover art, TRS-80. Cassette with large manual, yellow cover art, TRS-80. Grey box, shrinkwrapped, Tandy Color Computer. Silver box, Tandy Color Computer. Cassettes and large manual, TRS-80. Cassette with large manual, TRS-80. Cassette ("Pyramid") with large manual, pyramid interior cover art (blue title), TRS-80. Cassette with large manual, camel cover art (red title), TRS-80. Disk with large manual, TRS-80. Medium clear plastic case with inlay (Also has Ariolasoft Screen Shot Challenge card, unscratched), Spectrum. Slipcover box package, with metal pin, Spectrum. Cassette with case / inlay / document / map / clue sheet, Spectrum. Two-piece black cardboard box, BBC Micro. Empty plastic folder, Dragon 32. SoftSmith repackaging, shrinkwrapped, IBM PC. Sentient release, signed by Michael Berlyn, Apple II. Black plastic case, Commodore 64/128. IBM grey plastic folder, IBM PC. Two-piece slipcover box, shrinkwrapped, Atari ST. Hint booklet, invisible ink version, in non-resealable plastic package, unopened. Hint booklet, invisible ink version, in resealable plastic package. Two-piece slipcover box, shrinkwrapped, IBM PC. Two-piece slipcover box, IBM PC. Hint booklet, red window version, loose. One-piece slipcover box, Slash release, IBM PC. Hint booklet, red window version, in sealed blister pack. Loose disk, Sierra logo, Apple II. On-Line Systems small folder, Apple II. SierraVenture large manual/folder, shrinkwrapped, Apple II. SierraVenture large manual/folder, with poster, Apple II. Sierra On-Line box, Commodore 64/128. Encyclopedia Brittanica re-release, Apple II. Sierra release, loose disk, Apple II. Software Farm re-release in wooden box, IBM PC. Early clamshell case, Tandy 1000. Early one-piece box with white/black lettering on side, Apple II. IBM plastic case, original release, IBM PC. One-piece flipbox, shrinkwrapped, IBM PC. Parker Brothers release, shrinkwrapped, Sega Master System. Two-piece slipcover box, darker (brown) color, IBM PC. Two-piece slipcover box, lighter (tan) color, Apple II. European release in blue slipcover box, IBM PC. DVD case (King's Quest I - VII), European release, shrinkwrapped, IBM PC. Large horizontal flipbox (King's Quest I - VII), sealed, IBM PC. Large one-piece box (King's Quest I - VI), shrinkwrapped, IBM PC. Small one-piece box (King's Quest I - VII), sealed, IBM PC. One-piece slipcover box, Slash release, darker (brown) color, IBM PC. Two-piece slipcover box, darker (brown) color, manual signed by Roberta Williams, IBM PC. Two-piece slipcover box, lighter (tan) color, IBM PC. One-piece flipbox, darker color, IBM PC. One-piece flipbox, lighter color, Tandy 1000. Tona Severa hint disk, shrinkwrapped, Atari ST.
Two-piece slipcover box, Apple II. Hint booklet, invisible ink version, loose. Large horizontal flipbox, sealed, signed by Al Lowe, IBM PC. Small one-piece box, sealed, IBM PC. U.K. release, plastic case, shrinkwrapped, IBM PC. Two-piece slipcover box, signed by Al Lowe, Atari ST. Hint booklet, red window version, loose, with cover from blister pack. Two-piece slipcover box, signed by Al Lowe, IBM PC. Two-piece slipcover box, shrinkwrapped, Apple II. Hint booklet, invisible ink version, in non-resealable plastic package, cut open. Large two-piece slipcover box, IBM PC. Large box, sealed, IBM PC. European release ("Leisure Suit Larry 1-2-3-5-6 Collection"), IBM PC. German version ("Leisure Suit Larry 1-2-3-5-6 Collection"), loose CD and instructions, IBM PC. Impulse Software release, box, also includes Wizard and the Princess, Commodore 64/128. Impulse Software release, small plastic package, also includes Wizard and the Princess, unopened, Commodore 64/128. Load 'n' Go plastic package, top cut off, Commodore 64/128. Sierra On-Line small box, unopened, Commodore 64/128. SierraVenture large manual/folder, Apple II. Small On-Line Systems folder, logo on back, shrinkwrapped, Atari 8-Bit. Small On-Line Systems folder, no logo on back, Apple II. Big Red Computer Club release, loose disk, Apple II. Blue paper card, loose, Apple II. Loose disk, tan label with mountain photo and typewriter lettering, Apple II. SierraVenture large folder and disk, Apple II. On-Line Letter magazine (June 1981). Kixx European release, IBM PC. Two-piece slipcover box, Atari ST.
DVD case (Police Quest I - III, Open Season), "Classic Collection" cover, European release, shrinkwrapped, IBM PC. DVD case (Police Quest I - III, Open Season), European release, shrinkwrapped, IBM PC. Large horizontal flipbox (Police Quest I - III, Open Season, SWAT), sealed, IBM PC. Large one-piece box, (Police Quest I - III, Open Season, SWAT), European release, shrinkwrapped, IBM PC. Small one-piece box (Police Quest I - III, Open Season), sealed, IBM PC. One-piece slipcover box, Slash release, shrinkwrapped, IBM PC, IBM PC. Hint booklet, red window version, in opened blister pack. European release (English and German), shrinkwrapped, IBM PC. Large horizontal flipbox, shrinkwrapped, IBM PC. U.K. release, slipcover box, IBM PC. U.S. release, sealed, IBM PC. Large two-piece slipcover box, Macintosh. Loose Sierra On-Line disk, Apple II. On-Line Systems folder, color version, Apple II. On-Line Systems folder, color version, Atari 8-Bit. Time magazine article with cover art. DVD case, "Classic Collection" cover, European release, IBM PC. Large horizontal flipbox, sealed, IBM PC. One-piece slipcover box, Slash release, shrinkwrapped, IBM PC. Kixx European re-release, Atari ST.
Sierra slipcased box, embossed title with purple border, IBM PC. Sierra slipcased box, plain title, Atari ST.
Two-piece slipcover box, purple title, Apple II. Two-piece slipcover box, red title, Atari ST.
Large two-piece box, Apple II. Plastic bag, sealed, Apple II. On-Line Systems small folder, shrinkwrapped, Atari 8-Bit. SierraVenture large manual/folder, no "Notes" pages, Apple II. SierraVenture large manual/folder, with "Notes" pages, Apple II. One-piece flipbox, shrinkwrapped, Tandy 1000. Load 'n' Go larger plastic package, top cut off, Commodore 64/128. On-Line Systems small folder, IBM PC. Sierra On-Line small box, Commodore 64/128. Yellow paper folder with disk, Apple II. Two-piece box, with German instructions, Atari ST.
Blue folder, shrinkwrapped, IBM PC. Revised manual version, Commodore 64/128. Revised manual version, IBM PC. Thinner folder, shrinkwrapped, Commodore 64/128. Two-piece box, shrinkwrapped, wrap slightly torn, Apple II. Shrinkwrapped, Apple II / IBM PC. Paperboard folder package, Apple II. Paperboard folder package, in plastic bag, Apple II. Small cardboard case, Apple II. EA-style square flat folder (Software Toolworks), IBM PC. Square folder with attached booklet (Software Country), Commodore 64/128. Manual and cassette with case, in plastic bag, TRS-80. Cassette with case / inlay / instructions / clue sheet, Spectrum. Spinnaker slipcase box, IBM PC. Spinnaker two-piece box, shrinkwrapped, IBM PC. Two-piece small box, Apple II. Cassette in square black plastic clamshell case with inlay, Commodore 64/128. Signed by Robert Pinsky, Apple II. Paperboard folder package, Atari 8-Bit. Loose disk and manual, Atari 8-Bit. U.S. repackaging by Classic Works / Tri-Micro (with a non-IF game, Catch a Thief), Commodore 64/128. Square plastic folder, IBM PC. ASL release in plastic case, IBM PC. Telarium box, shrinkwrapped, Atari ST.
Telarium folder, shrinkwrapped, Commodore 64/128. Telarium box, shrinkwrapped, Apple II. Telarium folder, shrinkwrapped, Atari ST.
Trillium folder, shrinkwrapped, Commodore 64/128. Telarium box, shrinkwrapped, Commodore 64/128. ASL release in plastic case. Telarium folder, seals unbroken, Apple II. Broderbund release in large box, Commodore 64/128. Broderbund release in small box, Apple II. Mighty Micro magazine with cover art poster, Apple II. Flipbox, inside cover opened, Commodore 64/128. Regular box, shrinkwrapped, Tandy 1000. Regular box, shrinkwrapped, IBM PC. Medium black plastic case with inlay, Dragon 32. Cassette with case / inlay / instructions / deck plan, Spectrum. Cassette with case and inlay, clue sheets, Spectrum. Cassette with case and inlay (red), clue sheet (Fuddo and Slam), Spectrum. Cassette with case and inlay (red), Spectrum. Quest for Clues: The Manual of Swords (Quest for Clues V). Questbusters: Keys to the Kingdoms. Questbusters: Keys to the Kingdoms 2. The Lost City of Zork. Computer Adventure Game Secrets: The Condor. Zork Nemesis: Unauthorized Secrets and Solutions. Crystal Phoenix, Signed by author. The Eternal Enemy, Signed by author. The Integrated Man, Signed by author. Adventure Games for the Commodore 64. Whole Earth Software Catalog 1.0. Computer and Video Games Book of Adventure. Writing BASIC Adventure Programs for the TRS-80. Die Space Quest Story, German. The MDL Programming Language Primer. The Zork Chronicles, Signed by author. Adventures for Your Commodore 64. Exploring Adventures on the Commodore 64. Exploring Adventures on the Spectrum 48K. Exploring Adventures on the VIC. Creating Adventure Games On Your Computer. Commodore 64 Adventures, Swedish printing ("Äventyrsspel Vic 64"). Golden Flutes and Great Escapes: How to Write Adventure Games (for the TRS-80), no software. Golden Flutes and Great Escapes: How to Write Adventure Games for the Apple II, with software. Golden Flutes and Great Escapes: How to Write Adventure Games for the Commodore 64, with software. Introduction to MUD Multi-User Dungeon. Write Your Own Fantasy Games for Your Microcomputer. Graphic Adventures for the Spectrum 48K. How to Write Adventure Games. The Captain 80 Book of BASIC Adventures. A Shortcut through Adventureland II: Infocom. Compute! 's Guide to Adventure Games. Basic Adventure and Strategy Game Design for the Apple. Zork: Conquest at Quendor (#4), $1.95 price on front cover, no Tor logo, no ISBN. Zork: Conquest at Quendor (#4), No price on front cover, Tor logo on front cover and spine, has ISBN. Zork: The Cavern of Doom (#3), $1.95 price on front cover, no Tor logo, no ISBN. Zork: The Cavern of Doom (#3), Australian printing. Zork: The Cavern of Doom (#3), No price on front cover, Tor logo on front cover and spine, has ISBN. Zork: The Cavern of Doom (#3), Spanish printing ("La Caverna del Destino"). Zork: The Cavern of Doom (#3), U.K. printing. Zork: The Forces Of Krill (#1), $1.95 price on front cover, no Tor logo, no ISBN. Zork: The Forces Of Krill (#1), Australian printing. Zork: The Forces Of Krill (#1), No price on front cover, Tor logo on front cover and spine, has ISBN. Zork: The Forces Of Krill (#1), Spanish printing ("Las Fuerzas de Krill"). Zork: The Forces Of Krill (#1), U.K. printing. Zork: The Malifestro Quest (#2), $1.95 price on front cover, no Tor logo, no ISBN. Zork: The Malifestro Quest (#2), $2.25 price on front cover, Tor logo on spine only, no ISBN. Zork: The Malifestro Quest (#2), Australian printing. Zork: The Malifestro Quest (#2), No price on front cover, Tor logo on front cover and spine, has ISBN. Zork: The Malifestro Quest (#2), Spanish printing ("La Busqueda de Malifestro"). King's Quest: The Floating Castle. Twisty Little Passages: An Approach to Interactive Fiction. King's Quest: Kingdom of Sorrow. King's Quest: See No Weevil. The Leisure Suit Larry Story. Zork Grand Inquisitor: Prima's Unauthorized Guide. Starship Titanic: The Official Strategy Guide. The Official Book of Leisure Suit Larry, First Edition. The Official Book of Leisure Suit Larry, Second Edition. The Official Book of Leisure Suit Larry, Special Edition. The Interactive Fiction Collector's Guide, Edition 1.0. The Book of Adventure Games. The Book of Adventure Games II. Return to Zork Adventurer's Guide. The Police Quest Casebook, Second Edition. Creating Adventure Programs on the ZX Spectrum. Creating Adventures on Your BBC Micro. Keys to Solving Computer Adventure Games. Keys to Solving Computer Adventure Games, Book II. Skarbeck's Software Directory: Apple Computers. The Survival Kit for Apple Computer Games. The Authorized, Uncensored Leisure Suit Larry Bedside Companion. The King's Quest Companion, First Edition. The King's Quest Companion, Second Edition, thicker version. The King's Quest Companion, Second Edition, thinner version. The King's Quest Companion, Third Edition, $19.95 price. The King's Quest Companion, Third Edition, $21.95 price. The Official Zork Nemesis Strategy Guide. Return to Zork: The Official Guide to the Great Underground Empire. Return to Zork: The Official Guide to the Great Underground Empire, Japanese printing. The Book of Apple Software, 6th Edition. The Book of Atari Software, 1983. The Official Zork Grand Inquisitor Strategy Guide. Portal, U.K. paperback printing, signed by author. Portal, U.S. hardcover edition, signed by author. Official Book of King's Quest: Daventry and Beyond, First Edition. Official Book of King's Quest: Daventry and Beyond, Second Edition. Write Your Own Adventure Programs for Your Microcomputer. Programming Your Own Adventure Games in Pascal, hardcover. Programming Your Own Adventure Games in Pascal, softcover. Adventure Gamewriters Handbook for Commodore. Creating Adventure Programs on the BBC Micro. Computer Adventures: The Secret Art, Signed by author. Zork I, Japanese adventure novel. Zork II, Japanese adventure novel. Zork III, Japanese adventure novel. There are currently 1629 items in the YOIS vault. There are 837 individual game titles represented here. There are 188 different game companies represented here. Based on the ratio of items I have to items still on my want list, my game collection is 67% complete.